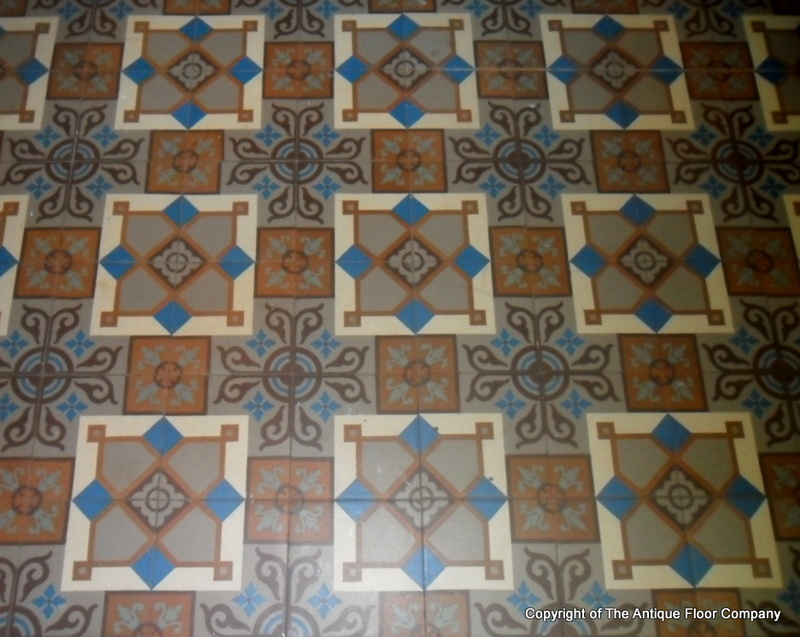 A large, 18.75m2 / 200 sq ft, antique ceramic encaustic antique Belgian floor dated c.1910, reclaimed from a house close to Charleroi in Belgium, now cleaned and restored to its originally fired beauty. 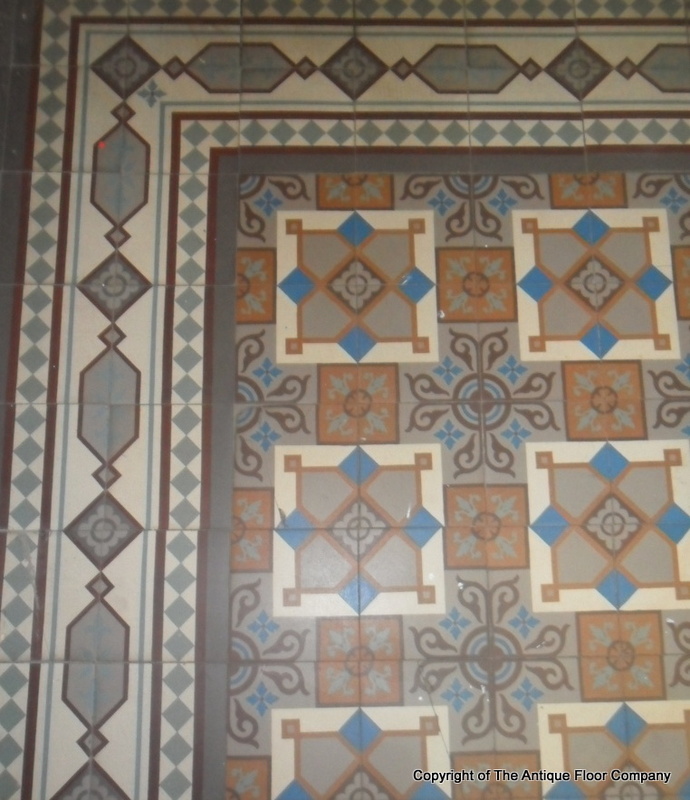 The floor was made by Ste Ghislain and the tiles are marked Ste Ghislain, Belgique. The floor comprises of a main field tile of 17.5cm sq in a palette of burnt orange, off-white, light grey and primrose blue with same size geometric borders providing the framing. The four and eight tile pattern is bold, complex and symmetrical in its tessellation. The borders are in the same greys and as the photographs below show are laid 'back to back' in duplicate. Given these are a large tile this means that the border width is 35cm/14 inches and there obviously exists the option in a smaller room to single lay the border tile, which will both double the linear length available as well as allow the main field tile to fully open up in the area. All four internal border corner pieces are available but two of the external corners will require mitre cutting. The floor has cleaned well and is in good condition. Additional high resolution photographs will be added shortly and we can also send out samples of the tiles so you can see both their quality and colours in the natural light of your chosen space. Being a highly fired ceramic the floor can be laid inside or outside of the home and will work very efficiently with under-floor heating systems. If you have any questions regarding our 18.75m2 / 200 sq ft antique Belgian ceramic floor with double borders, simply complete the short form below and we'll respond to your enquiry as soon as possible.